Dupaco Community Credit Union member Jenni Fregeau (left) visits with Dupaco’s Maddie Boettner at the Pennsylvania Avenue branch in Dubuque, Iowa. Fregeau turned to Dupaco to turn her credit around with the credit union’s credit-building tools. The day before her 29th birthday last year, Jenni Fregeau knew it was time to face her finances—and make some changes. Growing weary of the banks she had always used, Fregeau paid a visit to Dupaco Community Credit Union. The financial cooperative’s people-helping-people philosophy immediately resonated with her—and she knew she had finally found a financial partner that would help her get money ahead. 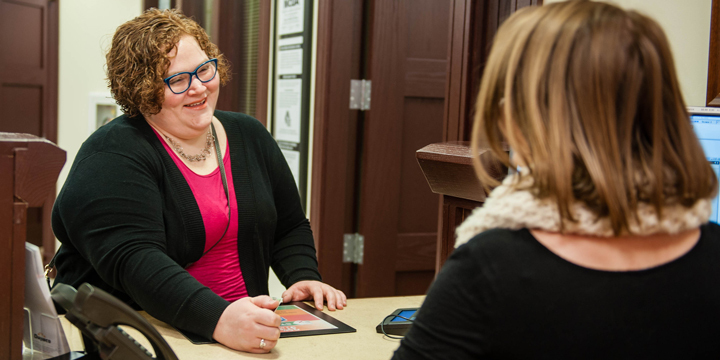 To start building credit, Dupaco’s Jessica Theisen opened a Credit Coach loan for Fregeau. With the low-interest loan, the money that’s borrowed is secured in a savings account for the term of the loan. The member earns interest dividends on the money held in savings while payments to the loan build credit. Theisen also opened multiple You Name It Savings accounts so Fregeau could begin systematically saving. With Dupaco’s help, Fregeau’s credit score has already climbed 90 points. She’s since received a free Credit History Lesson to learn how to continue building her score, which she monitors on Dupaco’s free Bright Track credit monitoring service.